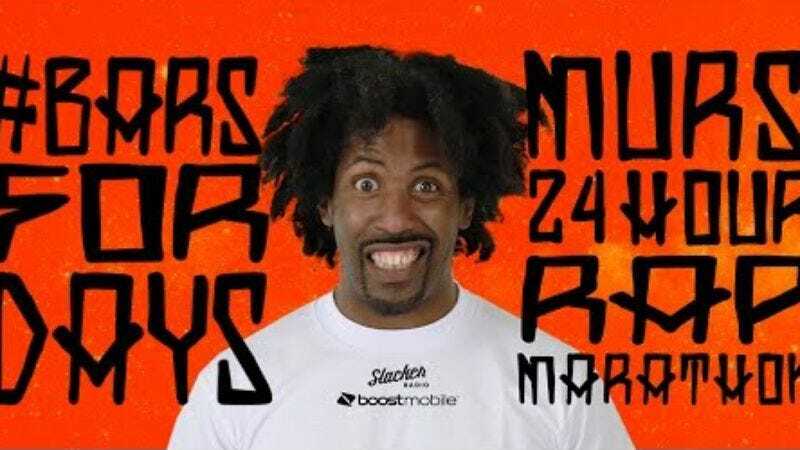 Los Angeles-based rapper Murs is attempting to get in the record books. Since yesterday, the 38-year-old underground hip-hop artist has been sitting in front of a camera rapping along to a mixture of his own songs and classic songs from his childhood all in an attempt to break the Guinness World Record for longest rap marathon. The marathon will end at 11 a.m. PST, totaling over 24 hours of continuous rapping (with one five-minute break per hour). So, check in on the livestream, rewind a couple hours, and expose yourself to some classic rap delivered for free by one of the greats.